I still view the Summer Olympics with youthful enthusiasm but some of the larger issues are harder to ignore. Rio de Janeiro – Just a beautiful city to watch during the Olympics. The Rowing and Canoeing had a particularly scenic mountain backdrop. I never tire of the Christ the Redeemer statue either. 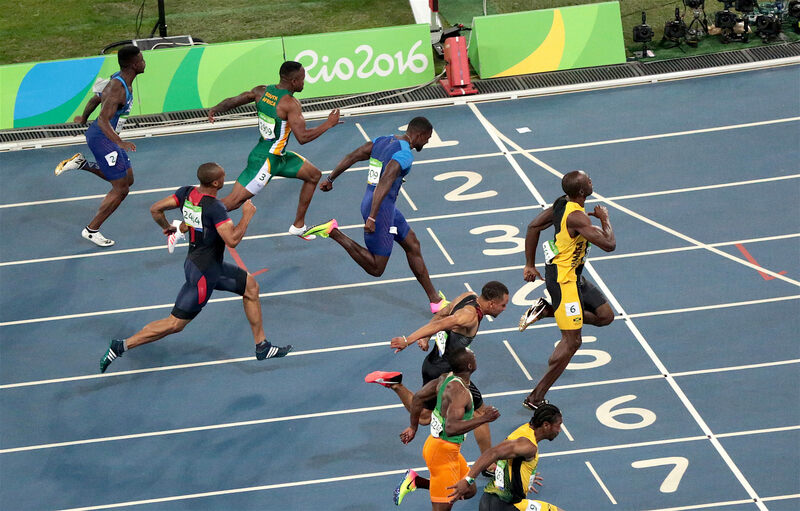 Usain Bolt – The triple threepeat was definitely the highlight of the games for me. It seemed harder and harder for Bolt to fight off the challengers and I held my breath until he pulled away each time, but pull away he did. Michael Phelps – Phelps is a force of nature and was the equivalent of Usain Bolt in the pool. Hard to see his record ever being toppled for most gold medals. Plus he introduced the world to cupping which most of the world knew about anyways. Just didn’t know it could produce bruises. Abbey D’Agostino and Nikki Hamblin – Great moment at the Olympics. Chloe Esposita – The winner of the Women’s Modern Pentathlon. For starters, I’ve been watching the Olympics since 1984 and never seen more than 20 seconds of the Modern Pentathlon. The last event which is a combined run and pistol shoot is super fun to watch. I think any medal that your country is not expecting to win is the most fun. Brazil in the Men’s Football – After seeing Brazil demolished 7-1 in the World Cup semi-final, the Brazilian team has come in for bucket loads of criticism and they started dreadfully slow in this tournament. Props to Neymar for fronting up for the tournament and just reward when he scored in the Final and then slotted the final penalty in the shoot out to win their first ever Olympic gold medal. Time zone differences – Just a really bad time zone to watch sport in Australia. Can’t wait for Tokyo. Best Football World Cup so far has been the one Japan and South Korea hosted. It is all about the time zone. Hate seeing empty seats at the venues, especially at the high profile events like the Athletics. Just taunted me the whole time. Men’s Basketball – I love seeing NBA players strut their stuff during the Olympics but until the U.S.A has a couple of viable opponents, the competition will be fairly boring. Golf, Tennis and Men’s Football – Golf and Tennis are late to the scene and have already established majors which are the pinnacle of their sports. If the top story during the Olympics is why the best players of your sport are staying away, one has to question why your sport is at the Olympics. Ditto for Men’s Football. At least the Women’s Football teams value the Olympics in a similar fashion to the World Cup. Media’s coverage of issues in Rio – It is always hard to tell if something is as bad as the media says it is. I would expect that it rarely is. I was however, pretty tired of the media telling me how bad the water was at Rio and how bad crime was as well. It felt exaggerated at best and pretty unfair at worst. Lochtegate – What a debacle. It says something about humanity when the thing we will remember most about the Rio Games is Ryan Lochte’s fabricated/exaggerated story about being robbed. Performance Enhancing Drugs – There didn’t seem to be as many failed tests during the games itself but involvement by reformed athletes like Justin Gatlin, Sun Yang and Yulia Efimova led to a lot of discussion around the topic. And then there was the ban handed down to the whole Russian Athletics Team for systematic doping, so there’s that. Kind of put an asterisk on the games circa 1980 and 1984. It is hard not to be cynical after looking at the medals per capita site. It shows that GDP and population are really the greatest indicators of how your country will perform in the Olympics rather than other more patriotic reasons. Kenya and Jamaica are the statistical anomalies of course. Next exciting episode will be on Wednesday, 31 August 2016 titled ‘2016 Summer Olympics – Performance Benefits for Hosts’. This entry was tagged Athletics, Australia, Basketball, England, Football, General Sports, NBA, New Zealand, Olympic Games, Soccer, Summer Olympics, United States. Bookmark the permalink.